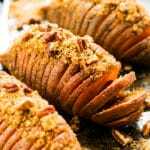 These Hasselback Sweet Potatoes with Brown Sugar & Pecans make a great gluten-free and vegetarian side dish for Thanksgiving, Christmas or any other holiday meal! Hasselback Sweet Potatoes for Thanksgiving! Is there a more exceptional vegetable?! 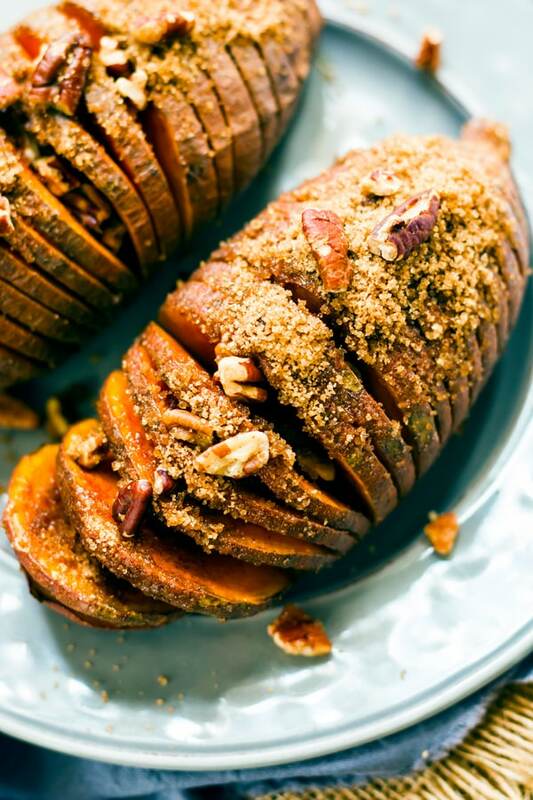 As if sweet potatoes could not get any better, why don’t we thinly slice, slather in butter, and then top with brown sugar and pecans? 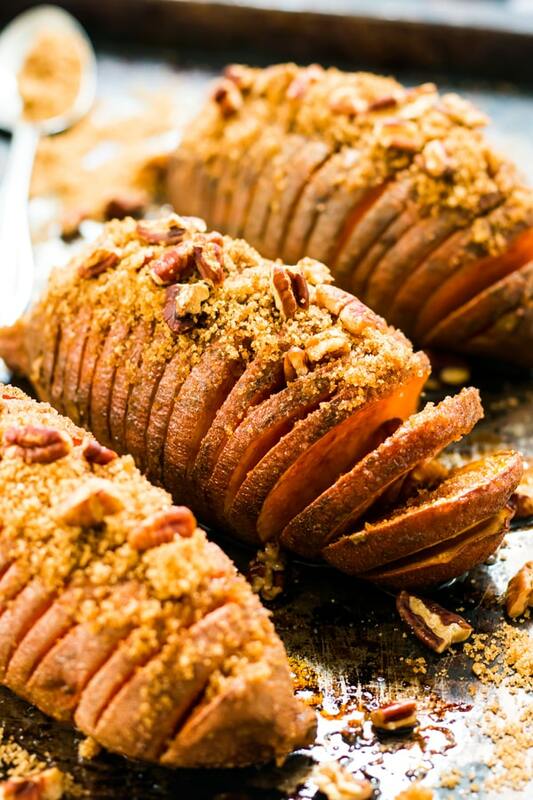 Yup… these hasselback sweet potatoes sound like a pretty darn good Thanksgiving side dish to me. See how easy it is to make these Hasselback Sweet Potatoes in the video below! Hasselback Sweet Potato Recipe Instead! Every year I look forward to one food at Thanksgiving… Sweet Potato Casserole. The epic combo of brown sugar and pecans is quite deadly when it sits atop a butter-infused bed of mashed sweet potatoes. However, for the past few months, we have been trying to limit our sugar intake. It has not been easy, but boy does my body feel a lot better. In this quest to reduce our sucrose-load, these Hasselback Sweet Potatoes were born. Thin slices of sweet potatoes are slowly roasted to perfection with an ample, but not outrageous, amount of butter. They are then topped with a sprinkle of brown sugar and pecans for the ultimate sweet-tooth-satisfying side dish. Pay careful attention when cutting your sweet potato into thin slices. You may even want to get an extra potato to practice on! A super sharp knife makes the cutting easier, but it can also result in a potato that gets chopped in half. So remember… be patient and gently slice! 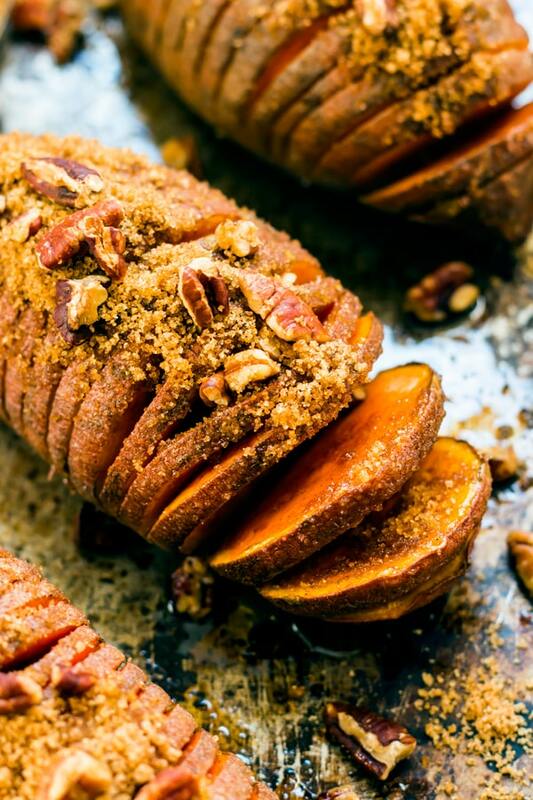 Want to make these Hasselback Sweet Potatoes even healthier? Are you vegan? Feel free to substitute vegan butter instead of regular butter! Want to keep your sugar unrefined? These sweet potatoes would be just as magical with coconut sugar as they are with brown sugar. Not feeling like eating so many carbs? Cut one of these bad boys in half and save the other half for your next carb craving. What is your favorite side dish to eat at Thanksgiving? I would love to hear in the comments section below. Wash potatoes and dry thoroughly. With a very sharp knife, cut the bottom ¼ - inch off of a sweet potato. This will help prevent the potato from rolling around while cutting. Next, at about ½ - inch from the end , make a slice ¾ of the way through the potato. Make another slice ¼ - ½ inch away from the previous slice. Repeat this until the entire potato is sliced thinly. Do this with the other 3 potatoes. Drizzle a little olive oil and sprinkle a bit of salt over each potato. 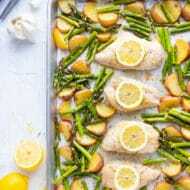 Place potatoes on a baking sheet and bake for 15 minutes. Using a pastry brush, spread 1 tablespoon of melted butter over the potatoes, reserving the remaining 3 tablespoons. Return potatoes to the oven for 10 minutes. Repeat this step three additional times, or until potatoes are cooked through. In a small bowl combine brown sugar, pecans and cinnamon. Toss to combine. Once potatoes are fork tender, sprinkle each with equal amounts of the brown sugar pecan topping. Return potatoes to oven for an additional 5-10 minutes. *Can use additional olive oil, coconut oil, or vegan butter substitute if vegan. 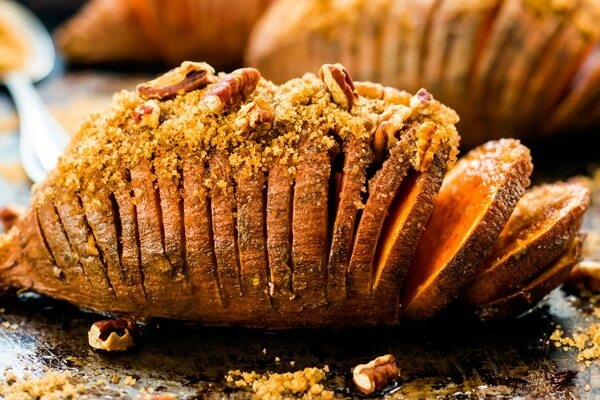 Want some more recipes like these Hasselback Sweet Potatoes with Brown Sugar & Pecans? Think I could pre roast these then just top with the butter and brown sugar and bake 10-15 min day of serving? I don’t have oven space for the entire cook time at once! Hi Austin! Yes, I absolutely think you can. Just make sure you bring them to room temperature before baking them the last 10-15 minutes. Can’t wait to hear what you think!! Do you think you could do ahead, maybe thru step 6? Then finish off day of? Hi Cheryl! Yes, you can definitely prepare these ahead of time through step 6. Just make sure they come to room temperature the day of before popping them back into the oven. I use the handle end of my wooden spoons, one on each side so you never cut thru the bottom. It makes it so much easier!! What a great idea!! I will have to try that out next time to make it a bit easier 🙂 Thanks for the tip!